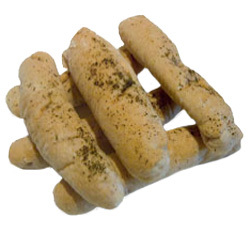 Description: Back and better than before - Each 11 oz package contains six of Cambrooke’s low protein, Italian Breadsticks topped with an Italian herb seasoning blend, each one approx 7-8" in length. Just heat and serve! Preparation: Thaw to room temperature or microwave on defrost 1-2 minutes. Serving Suggestions: Heat and add your favorite spread or serve plain with a pasta dish. Perfect to accompany soups or salads. Ingredients: Water, wheat starch, canola oil, psyllium fiber, polydextrose, sugar, leavening (sodium acid pyrophosphate, sodium bicarbonate, monocalcium phosphate), modified cellulose, yeast, xanthan gum, salt, dried herbs, oregano, garlic powder, calcium propionate (preservative), fumaric acid (preservative), sorbic acid (preservative). Contains wheat. From James Kelleher of Kingston, Massachusetts on 3/8/2012 . From alicia of Kingston, Massachusetts on 1/13/2012 .